The hemoglobin A1c test tells you your average level of blood sugar, over the past 2 to 3 months. It’s also called HbA1c, glycated hemoglobin test, and glycohemoglobin. The A1c test is also used to diagnose diabetes. People who have diabetes need this test regularly to see if their levels are staying within range and if they need to adjust their medicines. The sugar in your blood is called glucose. When glucose builds up in your blood, it binds to the haemoglobin in your red blood cells. The A1c test measures how much glucose is bound. What is a Normal Hemoglobin A1c Test? 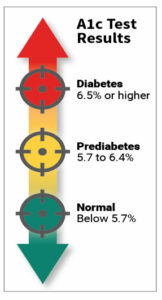 People with diabetes should have an A1c test every 3 months to make sure their blood sugar is in their target range.